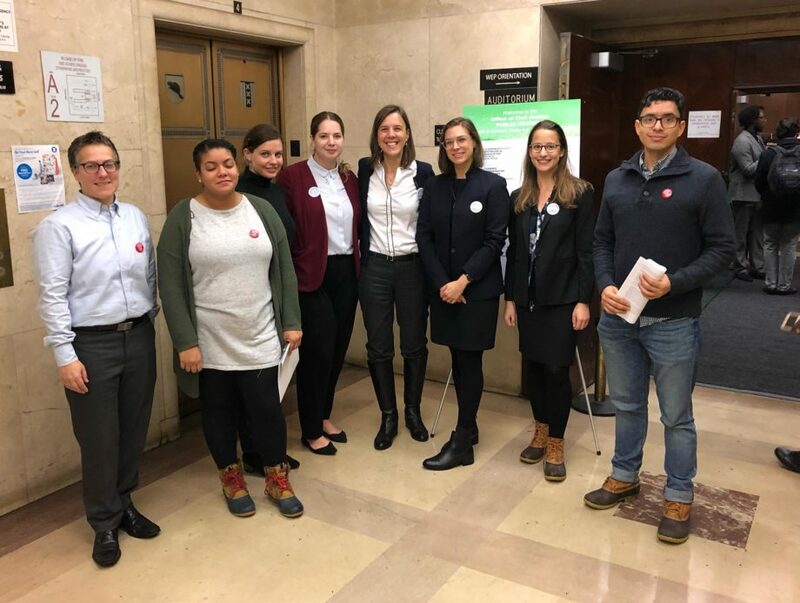 On Thursday, November 15, 2018, in the middle of the season’s first snowstorm, a coalition of unionized workers who represent and support tenants under the Universal Access Law testified at New York City’s Human Resources Administration’s Office of Civil Justice’s annual hearing on Universal Access to Counsel (UAC). Signed into law in July 2017, Universal Access to Counsel makes New York City the first city to commit to providing free legal services to all low-income residents in Housing Court. These services are being rolled in over several years. The Association of Legal Aid Attorneys (ALAA), Local 2325 of the United Auto Workers (UAW), is comprised of staff attorneys from The Legal Aid Society and all non-management staff at CAMBA Legal Services, among others. 1199 SEIU represents support staff and paralegals at The Legal Aid Society. Legal Services Staff Association (LSSA) represents all non-management staff at Legal Services NYC (LSNYC) and at Mobilization for Justice (MFJ) and is a part of the National Organization of Legal Services Workers, Local 2320 of the UAW. We recognize Universal Access to Counsel as a monumental piece of legislation. Our unions have supported the right to counsel and universal access in housing court since the very beginning, recognizing that high-quality eviction defense is central to protecting affordable housing and preventing displacement and homelessness in gentrifying neighborhoods. We are proud to be part of this effort and hope it is the first step toward bringing Civil Gideon to New York City. We believe that the continued success of Universal Access requires that the program evolve in response to lessons learned in the trenches. We ask the NYC Office of Civil Justice to work with those of us on front lines to ensure the success of this ground-breaking law. While there have been many triumphs in the first year of Universal Access, our unions are concerned that due to a lack of resources allocated at OCA and insufficient funding to the legal service providers, the Universal Access system as it stands, is unsustainable. We have identified three interrelated areas for which improvement must be made before Universal Access can work as intended: (1) client services; (2) court infrastructure and administration; and (3) provider funding and support. As zipcodes are added to the rollout of Universal Access, we are continuously forced to turn away tenants with strong cases in rent-regulated and subsidized housing in order to accommodate the mandatory zip code cases. By the time Universal Access reaches all zip codes, it will be too late for these tenants and their affordable units. Furthermore, our offices have had to turn away long standing clients—those who knew they could always rely on us in the face of their unscrupulous landlord’s tactics to force them from their homes. We ask that OCJ works with us to secure a stream of funding during the rollout of Universal Access or grant us the discretion to set aside a certain portion of our grants that allows our organizations to protect the rent-regulated and affordable housing stock in zip codes not currently covered. Housing courts in every borough are still struggling to properly and efficiently administer Universal Access. Particularly concerning to all of our members is the lack of confidential interview space to conduct intake on our referral days. In Staten Island, intakes take place in a back area with open cubicles and landlord attorneys roaming around. In Queens, we only have access to one room in the courthouse in which to do intake for UAC. As a result, we are forced to resort to talking to people about their issues in crowded hallways. In the Bronx, we are forced to conduct cursory intakes in the hallways and we must schedule each person for a private intake at a later date in our office. On countless occasions, tenants have disclosed sensitive information within earshot of their landlord’s attorneys. Without confidential interview space, tenants are denied their fundamental attorney-client privilege. On intake days, providers see between up to fifty people and are expected to appear right away for special zip code clients – with no investigation and little information on the background of the case itself. With a first appearance we are able to adjourn for investigation but for clients who have previously turned down services, we are often forced to make decisions on the spot without the proper background checks. The resolution parts administering Universal Access are constantly overburdened. Even after return dates on Orders to Show Cause were moved to the afternoon calendar, many resolution parts still have between sixty and ninety cases on for the morning calendar. Our members have reported that it can take upwards of two hours to make an application or argue a motion. Some boroughs have assigned additional court attorneys to the Universal Access resolution parts but cases are still constantly bottle-necked because there are not enough judges handling the selected zip codes. We believe that zip codes need to be spread among more judges in each borough and the courts should implement a basic cap on calendared cases that does not exceed fifty cases per session. In Manhattan, the judge in the UAC part frowns upon litigation and leans heavily on parties to either settle quickly or go to trial. Attorneys and non attorneys have to fight with HRA and APS to get clients much needed services – which attorneys can not provide – but because these agencies have not grown as quickly as free legal services, the process for outside help takes significantly longer. We are working with clients who experience mental illness and other ailments that constrain their ability to keep up with the fast paced nature of the practice. But rather than the City putting more money into much needed non-legal services to meet the non-legal needs of UAC clients, we are just expanding into more zip codes without examining the issues with the system as is. Through the efforts of our respective unions to recruit and the efforts of the organizations for which we work, we have hired a vibrant, diverse staff who believe in Universal Access. We are saddened and dismayed to report that our members are repeatedly subject to discrimination and micro-aggressions by court staff. For example, members who identify as people of color have been asked directly by judges if they were our clients, or have been scolded for being in designated “attorney” areas. Our members have observed and experienced inappropriate sexual and racist comments by members of the landlord’s bar and court personnel. We urge that all court staff, including employees of the Human Resources Administration, attend mandatory anti-bias training to make housing court a more professional and welcoming environment to people of color. Finally, our organizations are facing substantial attrition of both new and experienced attorneys. While there has been an unprecedented expansion in funding for civil legal services, none of the grants held by our respective employers allows them to fund our work in a way that would allow us to provide consistent, high-quality representation to our clients. This forces providers to cut corners: making the tough decision not to hire social workers and hiring fewer process servers, secretaries, and paralegals than we really need. As a result, our support staff are overloaded and attorneys take on overwhelming amounts of peripheral administrative work, leading to widespread frustration and inefficient delivery of services. The practice of housing law is now driven by quantity and not quality. Attorneys mandated to take cases are expected to reach a quick resolution in a very short time frame which, frankly, does not allow attorneys to grow and develop in the practice. Rather, attorneys learn just enough to get by and resolve cases so that they can quickly move onto the next. Tenants deserve attorneys who have the freedom to comprehensively and creatively litigate their cases, not treat them like stipulation mills. Since organizations cannot maintain caseloads with this level of staff attrition, newly-hired law graduates are placed on intake and in court within a week of beginning employment – with zero training. Our low income tenants deserve better than that. Universal Access to Counsel is a tremendous step forward for New York City’s low income tenants. For its vision to truly be realized, we ask that case caps and sufficient funding for support staff, including funding for social workers, be incorporated into the Universal Access grants to protect our shared goal of high-quality representation and meaningful access to justice for New York City tenants, and that the City and State work to provide private space in the courthouses and eliminate procedures that contribute to UAC recipients receiving a lesser version of representation.